Greetings! This is Maria, the person behind this website and the one answering all your emails and helping you with your websites. I started this business whilst I was living in New Zealand, a country I was fortunate enough to call home for a few years. Both my husband and I however suffer from "itchy feet" very frequently (even since a 21 month backpacking trip around the world changed us forever), so... in 2014, we decided that, instead of getting a mortgage, we would sell or donate pretty much everything we owned so that we could travel instead - indefinitely. After 3 years living out of our suitcases, we now have a little homebase in Europe, where we return to from time to time to recharge batteries. When we're not at home, we can be found visiting family and friends or, most likely, house and cat sitting in a new location. 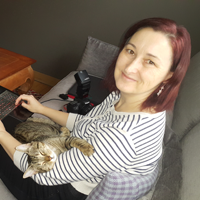 Apart from developing websites, I also enjoy things like photography, the environment, volunteering, exploring new places, cats (and other furry critters), and chocolate! Did you know? I can also help you with WordPress websites. NOTICE: Please note that due to work load with other projects I can only take on smaller jobs - i.e. small tweaks to clients' DIY websites or simple website development (including small shops up to 50 products or so). I endeavour to answer any emails within 1 business day. You can write to me in English or Spanish. Please check out the online Tutorials first, as the answers to the most common questions can be found there and that way you don't have to wait for me to respond. If your question has not been answered by the tutorials, do drop me a line. And don't worry, your email address will be kept confidential and I promise I won't fill up your inbox with spammy emails. Please note that in order to keep my prices competitive, I have a "reasonable use policy" of up to 20 minutes in total per website per customer (per calendar month) as part of each hosting package. Thank you for your consideration.